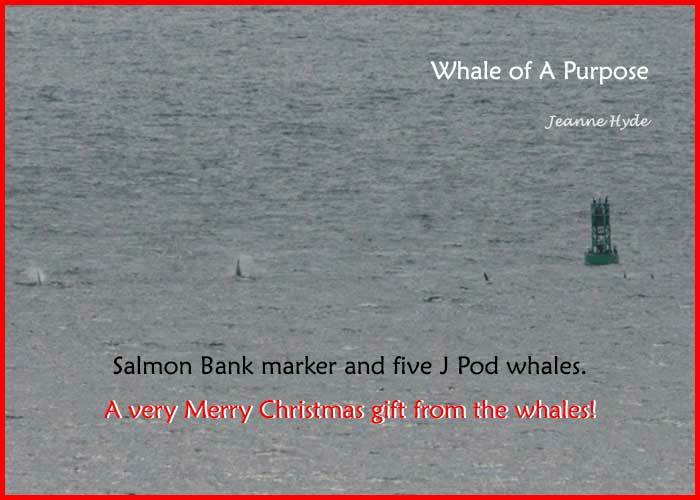 12-28-15 Great Day on the Water! 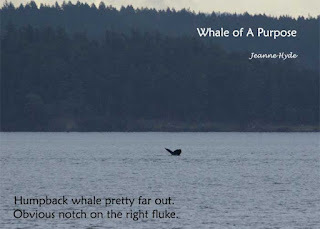 ...calm seas, no rain, trip?...oh, yes!...no whales...no matter - calm seas and no rain! ...but then about an hour before the trip on Peregrine - Ts showed up...and they were coming our way...and so was Ron on Eagle Wing...I just had to say 'Hi!!" 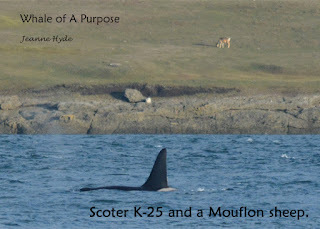 ...I love the size difference - yikes! 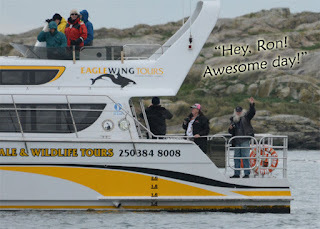 ...nice to see some friends while out there today...Ron, whales, and even some ancient murrelets! 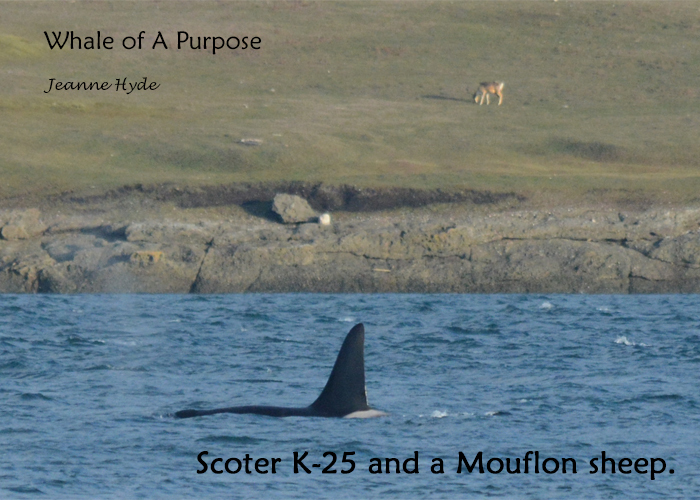 ...and our Resident friends...no telling where they are except that at the moment they don't seem to be anywhere near these parts! 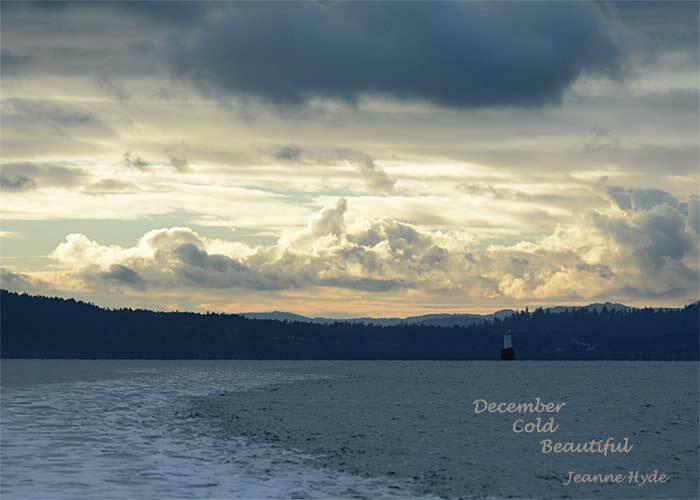 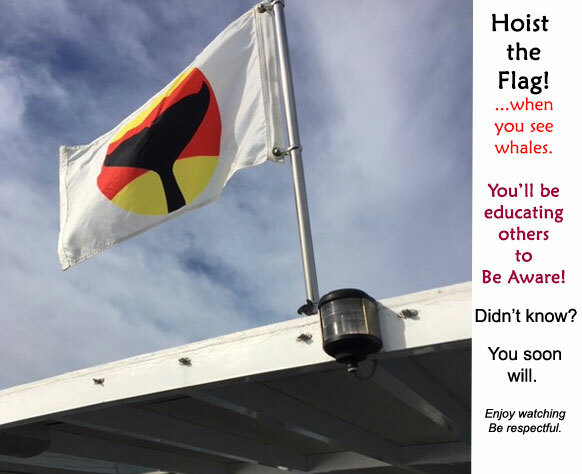 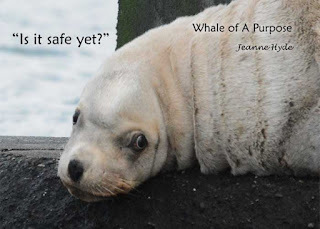 12-20-15 The News Came from the Ferries! ...the last of the blows we saw were on the San Juan Channel side with Shaw Island behind them...that was at 9:15...they looked like they were coming up the channel...and that was all...hummmm..
...just as I am pulling into the lot I see dorsal fins just to the up island side of Goose Island - "oh, my goodness, I made it!" ...taking a picture of a couple of them with the grasses along the shoreline looked pretty neat...I looked at the picture - IT WASN'T THERE!...neither were all but a couple of the other images I had taken - arrgh! What have I gone and done now? 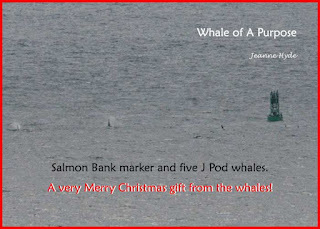 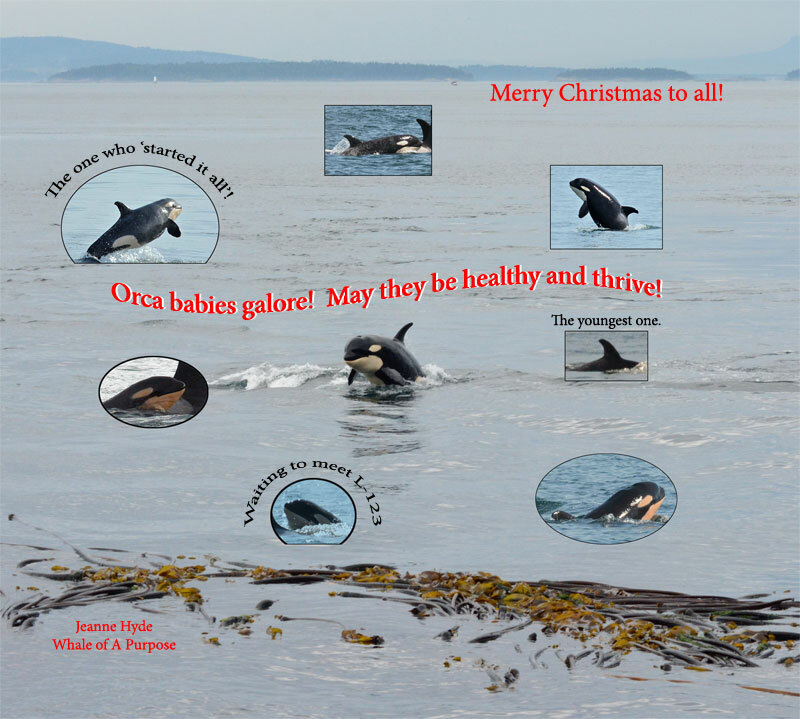 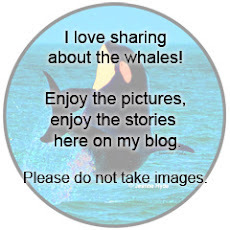 A Merry Christmas to all who know and love these whales. 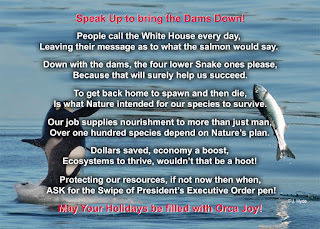 with lots of wild Chinook salmon! 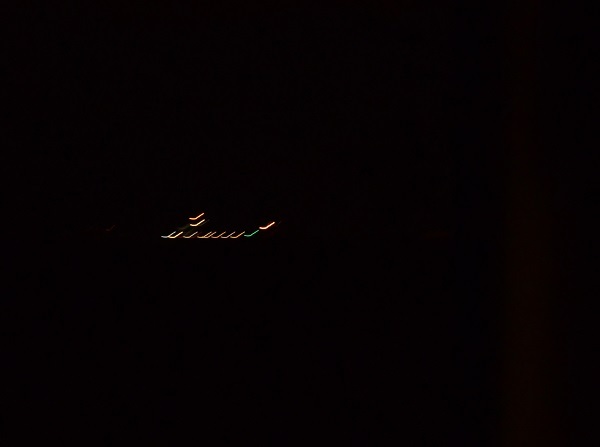 And if I get those images out of my camera I will post them! Wednesday, December 16th (This post is updated 5a.m. 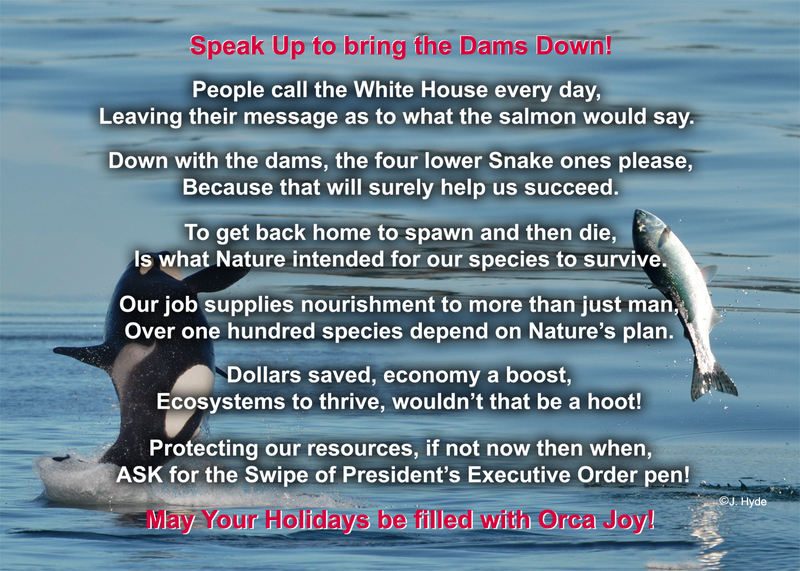 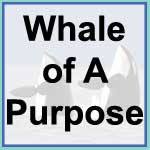 12-17- I was waiting for the Center for Whale Research to make the announcement.) 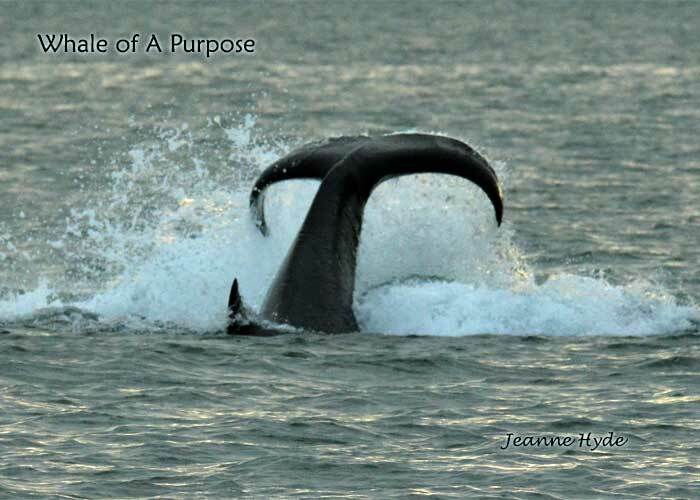 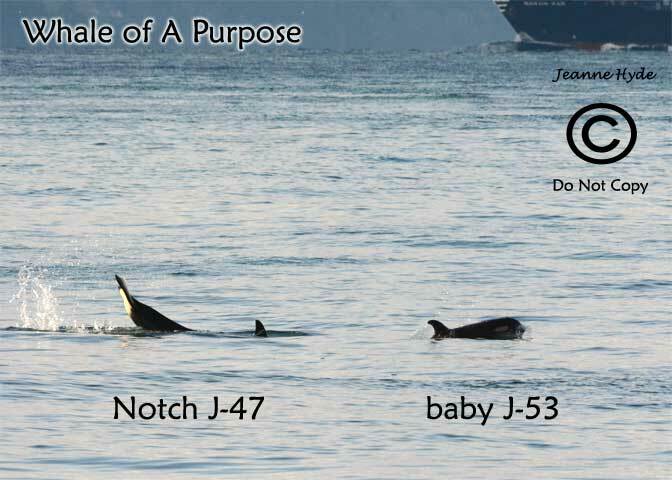 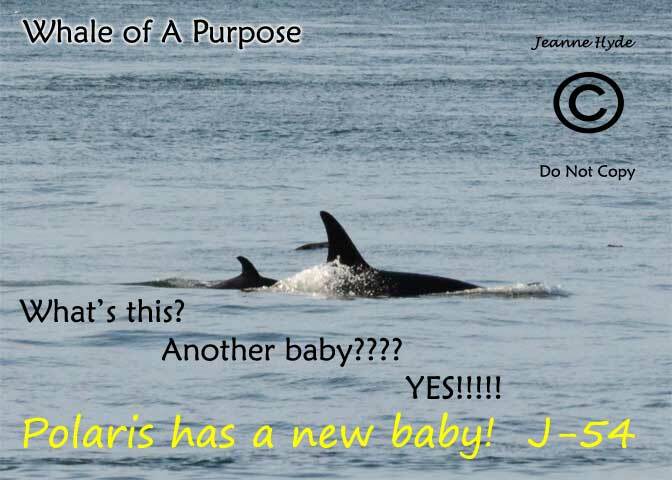 Scroll down the page to see Polaris and NEW BABY J-54 as they passed the lighthouse the morning on 12-16! 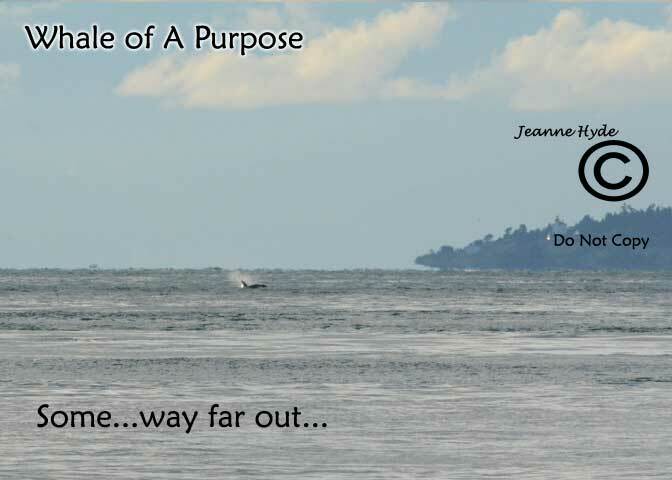 ...so off to town to mail a Christmas package to Alaska...(the receipt says it was 9:33 -it does play a role in this)...it was calm the sun was shining, so I decided to go home via the water view way...when I got to the west side the water was flat calm...wow!...so I stopped at the corner...get out of the car...don't even get the binos, when I see a dorsal fin! 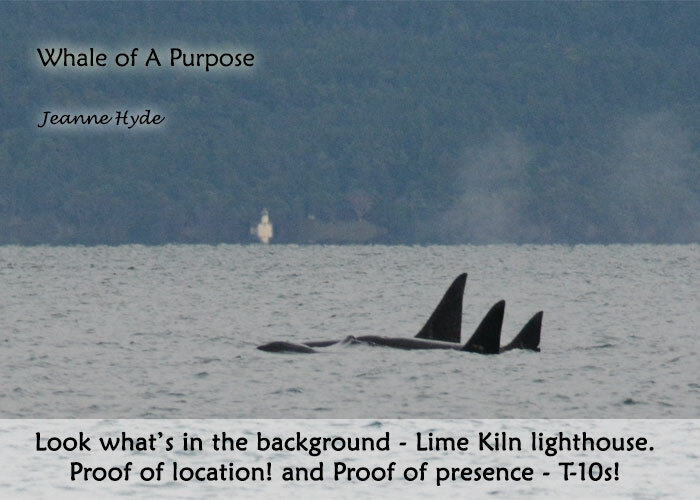 ...and here they came..it was just about 10 a.m....I still didn't know who was there until I heard echolocation clicks over the Lime Kiln hydrophones - "Rezzies!" 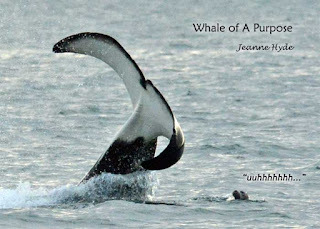 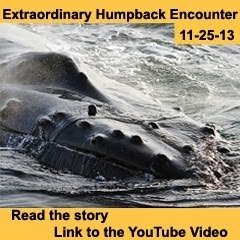 ...Talk about mixed up whales! They were moving around, switching places so much it seemed like there were twice as many babies as there were. 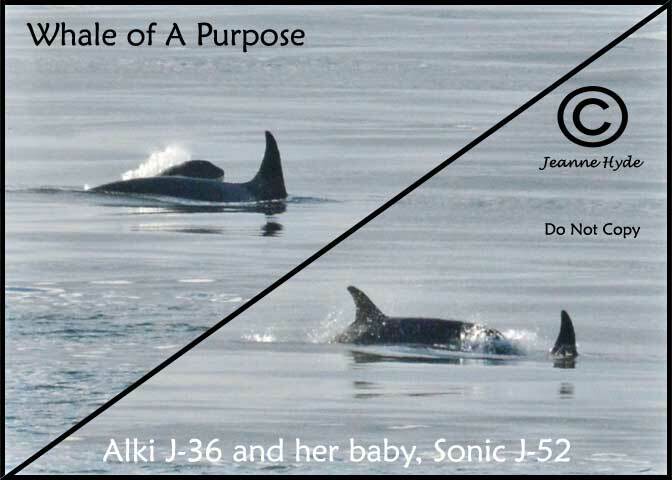 ...there were some direction changes for a several minutes, a few surface behaviors, and some porpoising (too far away at that point for images)...they were catching up to Tahlequah and Princess A. 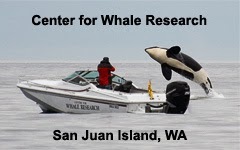 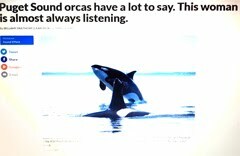 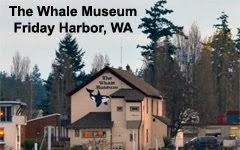 ...I immediately called the Center for Whale Research (link to read the rest of the story on their announcement page) - of course! 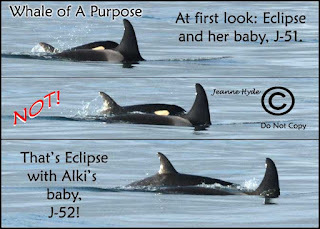 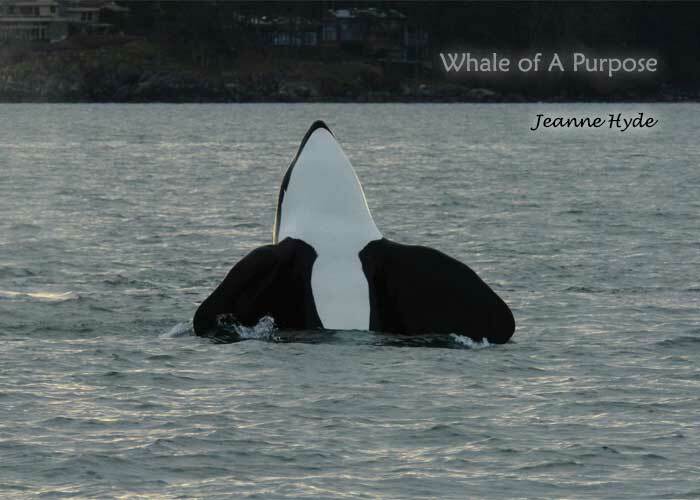 ...I could hardly contain myself, but I knew I had to keep it to myself until CWR confirmed it...look to see the awesome photos Dave Ellifrit got of the newest member of J Pod~ - WOW! 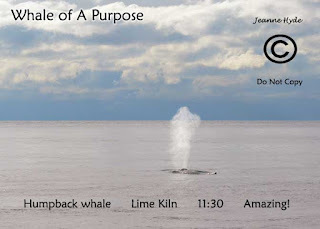 ...little did I know a humpback was coming down island and surfaced about 200 yards from shore right by where I was standing...needless to say...surprised me to pieces with that blow! 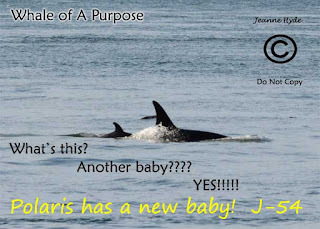 ...but that wasn't all...more on this day later...with what was added about the new baby - that was all - isn't that enough!! ...not only was it nice to have a night without those massive winds, it made it possible to hear, at first, some extremely faint sounds...that was at about 3:40 a.m.
...the calls faded off as opposed to stopping abruptly...did they go behind one of the Canadian islands?...hummmmm...will they show up again in the daylight or over one of the hydrophones...I hope! 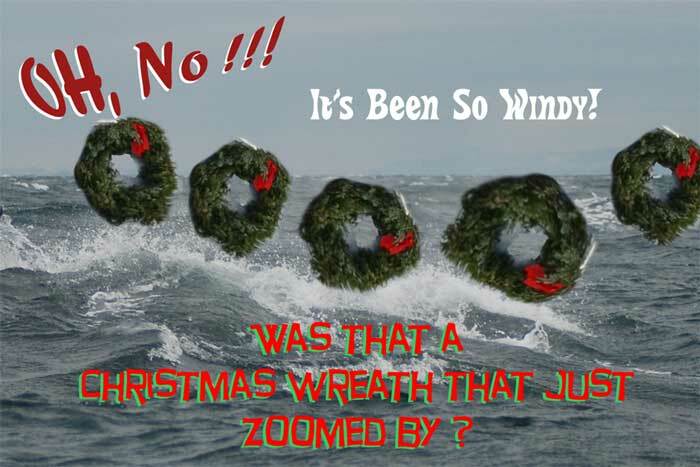 12-9-15 It's Been So Windy! 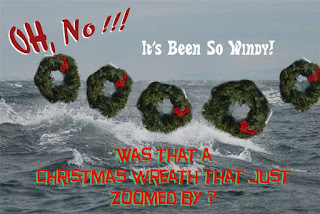 Watch out for flying Christmas Wreaths!! 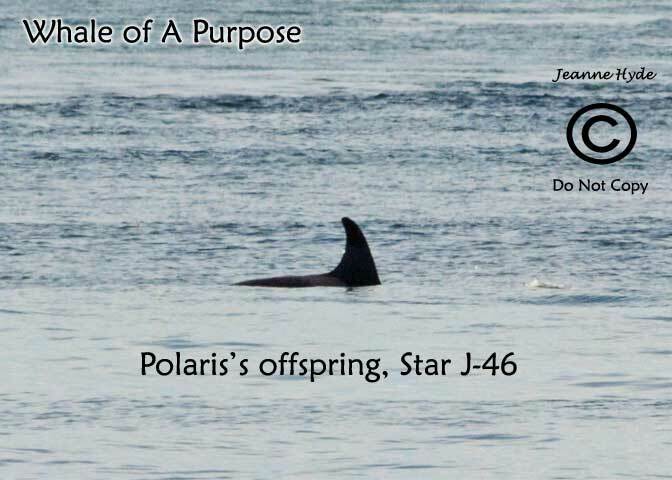 12-7-15 Were Those Pacific White Sided Dolphins?! 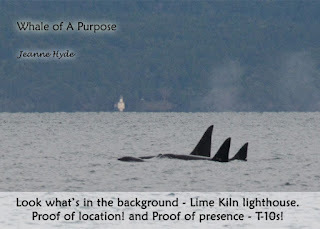 ...maybe someone will spot them, that is when the seas decide to calm down, because right now it would be near impossible to tell Lags from white caps! 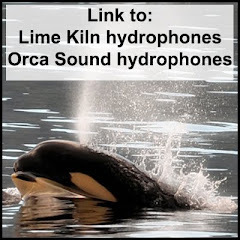 12-5-15 FOUR Hours Over the Hydrophones! 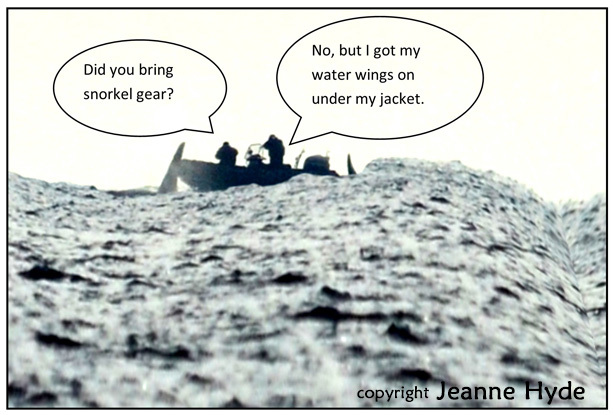 ..."okay, now I know where they were, it's back to dealing with the firewood,"
...stay out of the way of falling tree branches too! 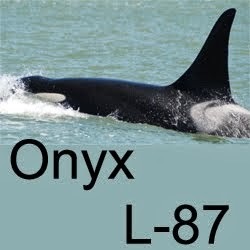 ...I learn from Ivan, Western Prince, who had gotten out there to see just who was present - it was Group A and the K13s! 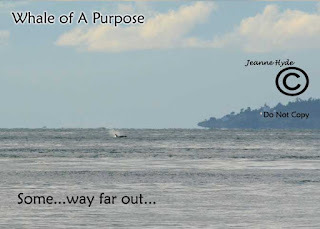 ...no sooner do I get on to the next thing for the day..."whales in San Juan Channel" - yikes...off and running again...this time toward the bottom end of the island...oops!...they turned north...back up island...I actually made it before they got there but they were so extremely far away...there were a lot of birds flying above the whales...which will sometimes have one thinking it is Ts. Not this time. 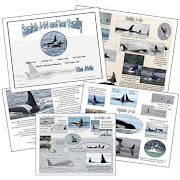 ...I learned from Ivan of the Western Prince that it was Group B whales!...very cool...so it seemed that all of the family groups were represented even if not all in the same location at the same time. 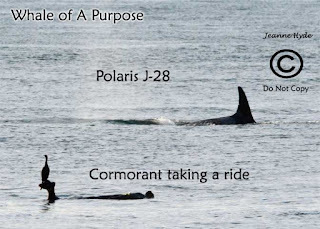 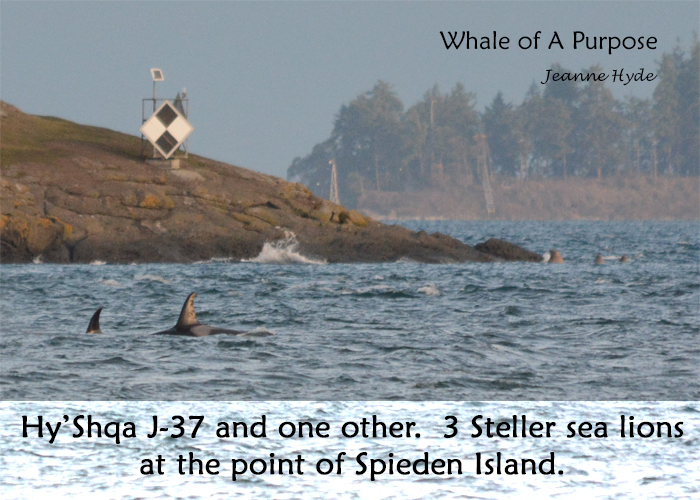 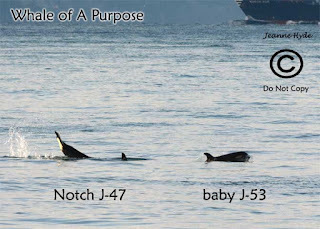 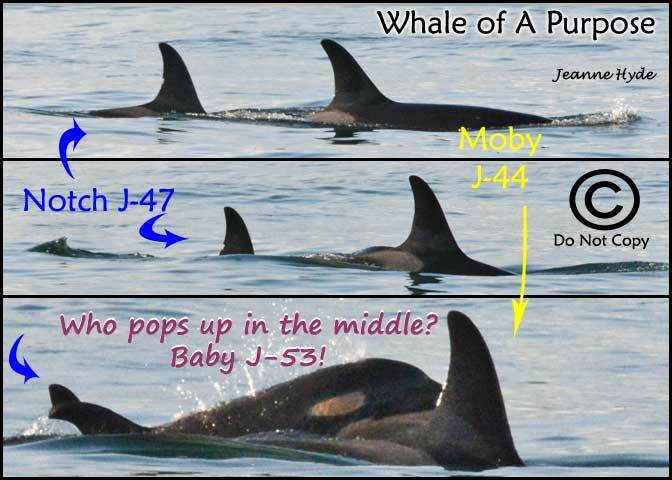 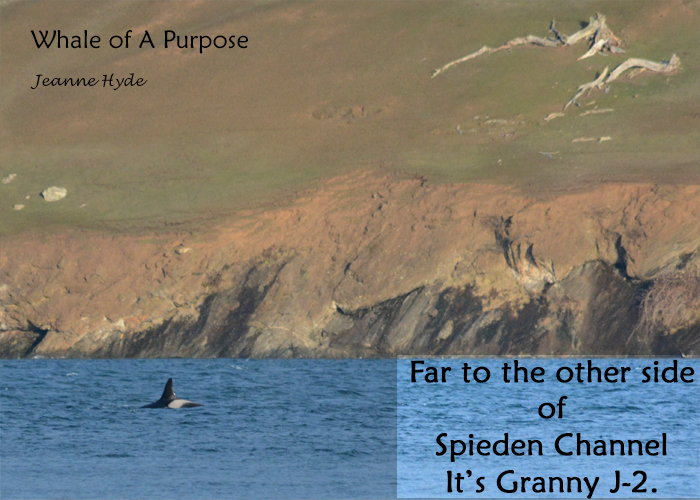 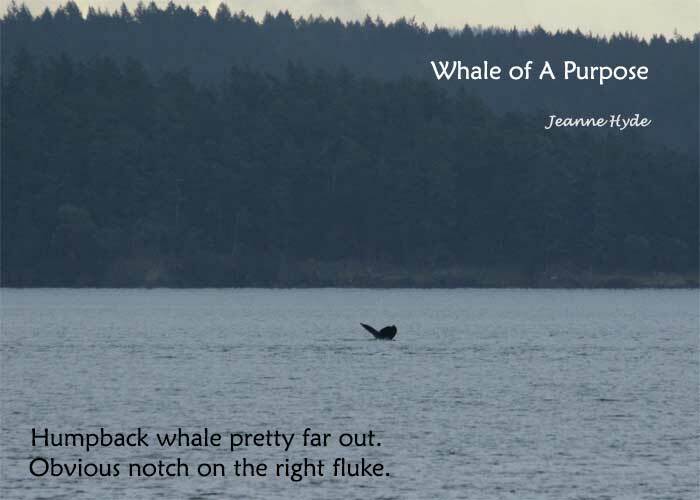 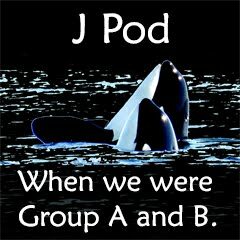 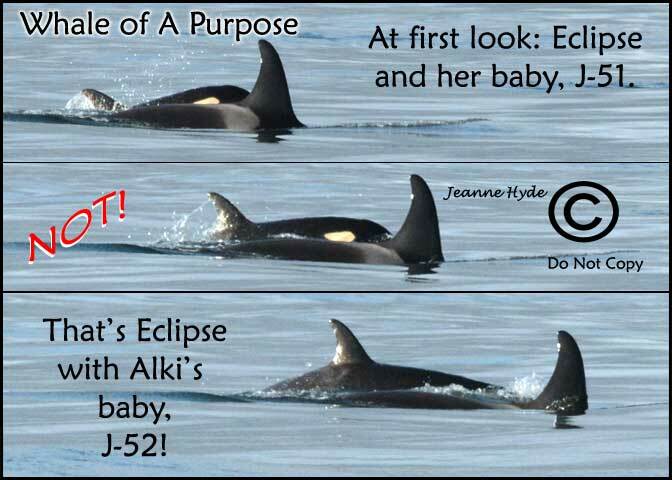 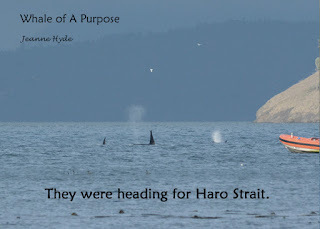 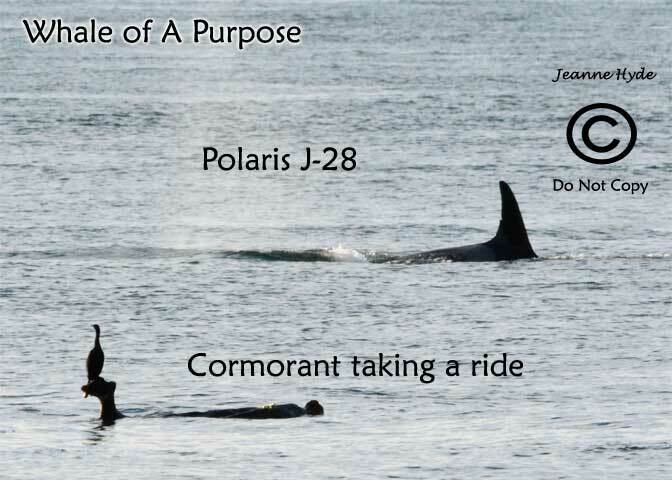 ...so where will the K13s show up again next?...and will all of J pod be together next time we see them?